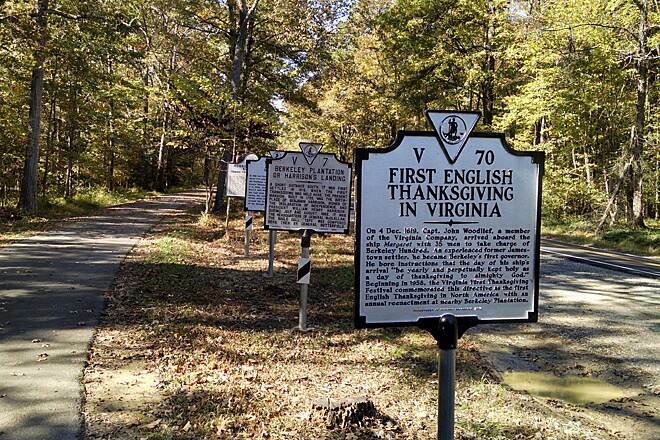 The sprawling Virginia Capital Trail snakes along the James River and State Route 5, a Virginia Scenic Byway, for 52 paved miles from the state’s capital of Richmond to the historic capitals of Jamestown and Williamsburg. 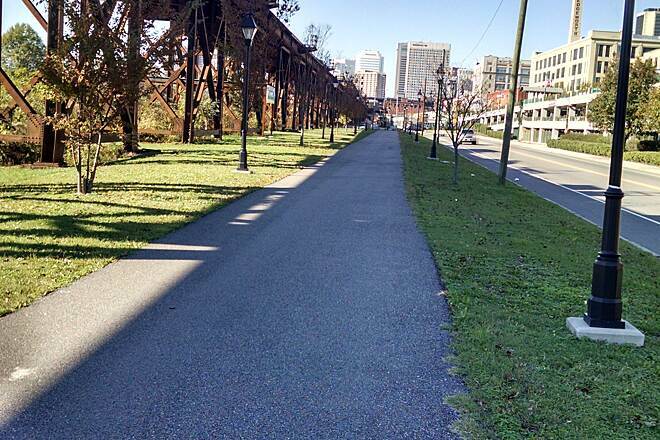 The trail is not built on a former railroad, but the half-mile segment in downtown Richmond is rail-with-trail, hence its rail-trail designation. 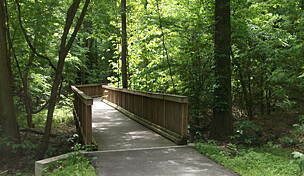 The southern end of the trail is known as the Greensprings segment and begins near the Jamestown Settlement, which provides a unique glimpse of early American history and culture. 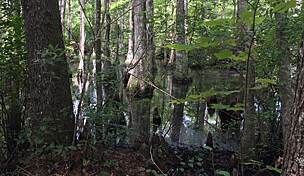 The trail continues northwest to SR 5, passing Revolutionary War battlegrounds and a 40-acre wooded wetland and wildlife area along the way. 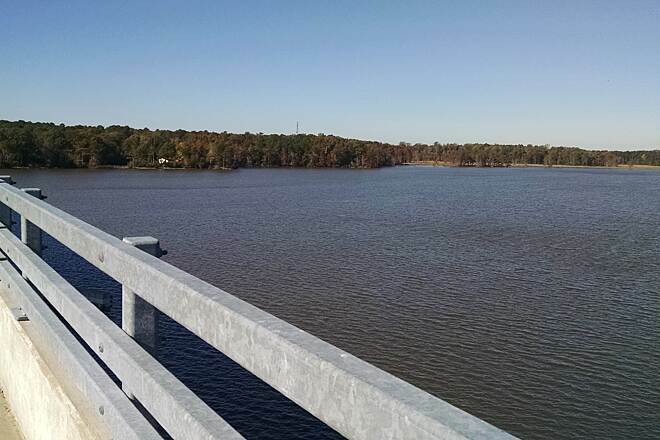 The Chickahominy Riverfront segment seamlessly picks up at the intersection of SR 5 and Greensprings Road (SR 614) and travels to the Chickahominy Riverfront Park, where trail-goers will enjoy majestic views of the James and Chickahominy Rivers. 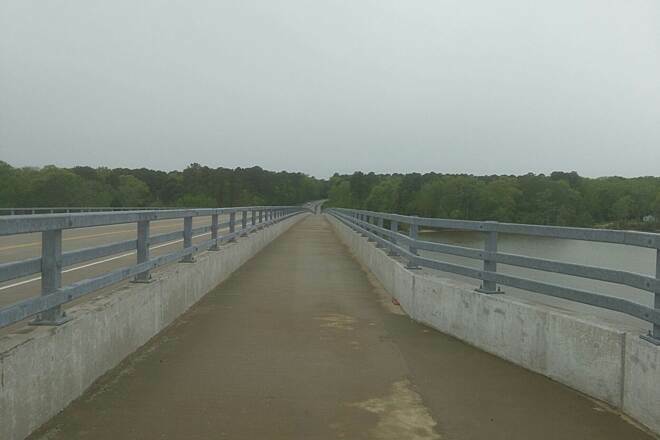 The trail crosses the Chickahominy River on the Judith Stewart Dresser Bridge, which includes a 10-foot wide path separated from traffic by a divider. 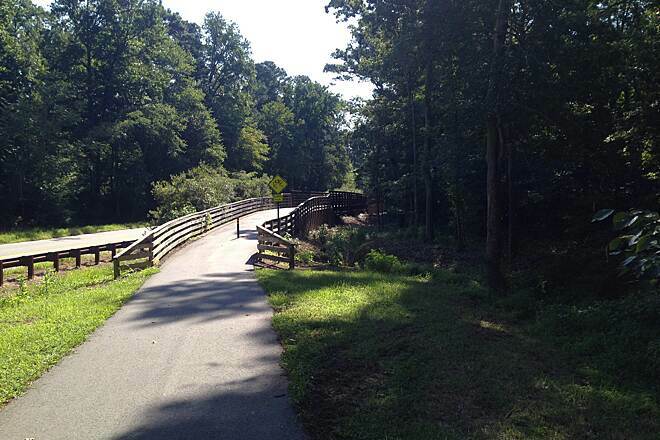 The trail’s Sherwood Forest segment begins on the western bank of the river, continues along SR 5, and passes the Sherwood Forest Plantation for which it is named. 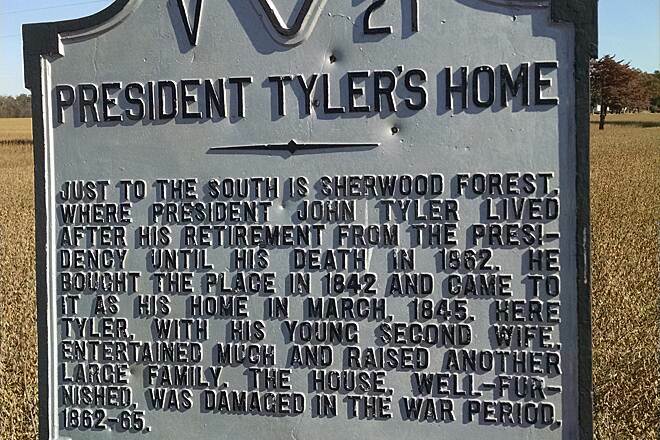 President John Tyler lived in the estate in the mid-1800s and, although the Tyler family still owns the home, the grounds are open to the public. 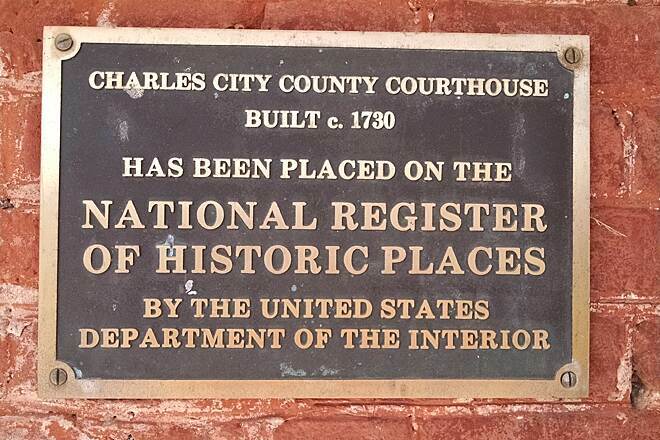 This section ends at the Charles City County Courthouse, a one-story brick building dating back to 1730 and listed on the National Register of Historic Places. Continuing west from the courthouse, the Charles City County segment passes many colonial plantation homes, including the Berkeley Plantation (just off Harrison Landing Road). It’s the ancestral home of U.S. Presidents William Henry Harrison and Benjamin Harrison. 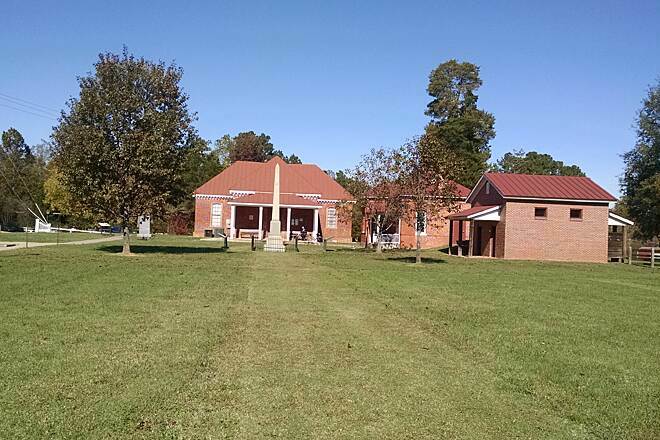 The New Market Heights segment runs near the Shirley Plantation, where the mother of Confederate General Robert E. Lee was born. 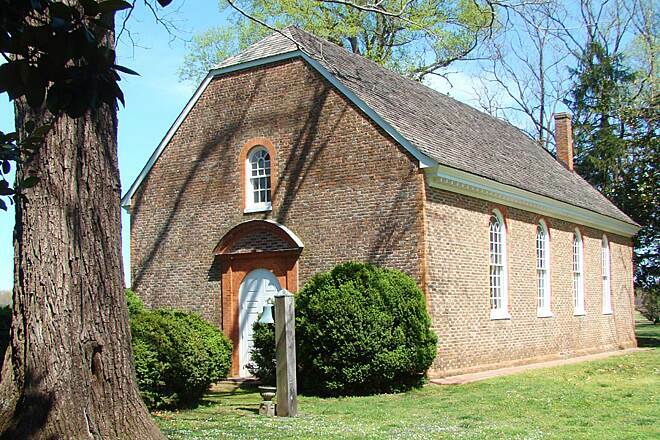 Dating back to 1613, it’s the oldest plantation in Virginia and a National Historic Landmark. The building is located about 3 miles west of the trail on the banks of the James River and is open daily all year except on major holidays. The Park Phase forms a 3.5-mile horseshoe away from State Route 5, which the majority of the trail so closely follows. 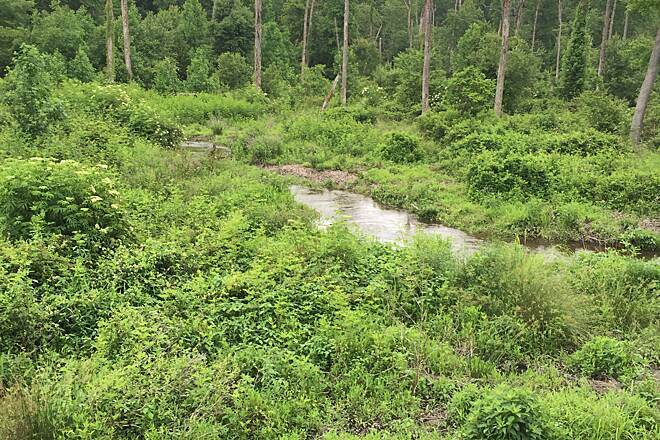 This deviation allows the trail to connect to Dorey Park, a popular spot with many recreational amenities, including a playground, sports fields, tennis courts, disc-golf course, picnic areas, a nature trail, a fishing pond, and an off-leash dog park. 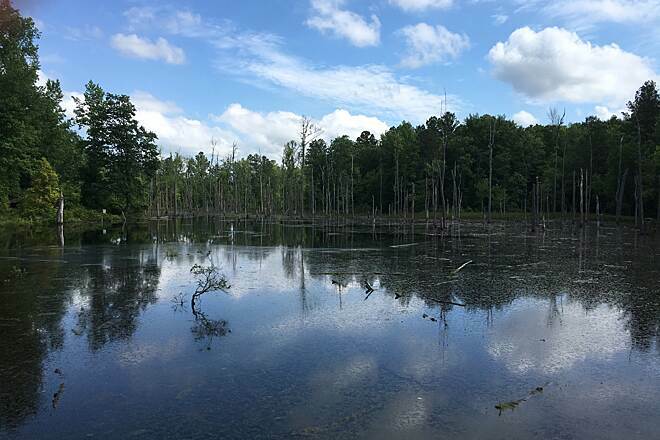 The Varina segment runs by Henrico County’s Four Mile Creek Park, a wooded outdoor gem with a canoe launch for accessing the creek. The community is named for Varina Farms, a plantation established by early English settler John Rolfe, who married the famed Pocahontas. The Richmond Riverfront segment, at the northern end of the trail, parallels Dock Street through Shockoe Bottom, one of the city's oldest neighborhoods. It begins at the Canal Walk and ends at Great Shiplock Park, which commemorates the canal lock built here in the 1850s. Greensprings: Park at the Jamestown Trailhead off SR 31, which also has restrooms and picnic tables. 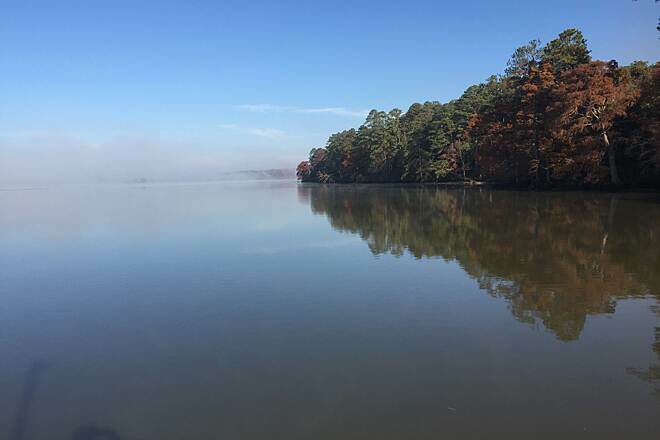 Chickahominy Riverfront: In Williamsburg, park at Chickahominy Riverfront Park (1350 John Tyler Memorial Highway) or Jamestown High School (3751 John Tyler Highway) during non-school hours. Restrooms and picnic areas are available in the park. Charles City Courthouse: Park at the Charles City County Visitors Center (10760 Courthouse Road); restrooms are also available here. Another trail parking lot is available farther north, where SR 5 crosses Herring Creek. Park segment: Parking is available at Dorey Park (2999 Darbytown Road). 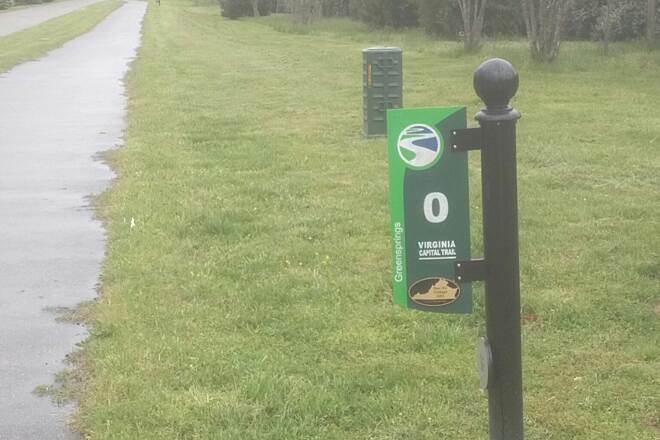 Varina: Parking is available at Four Mile Creek Park. Richmond Riverfront: Park at Great Shiplock Park (intersection of Pear and Dock Streets). During a heat wave, we decided to ride this trail. Stayed mid-way and rode to Jamestown one day then to Richmond the next day. What a perfect trail! Thank you to those who had the vision to create this perfect riding trail. We took lots of water but wanted to stop to cool down and found adequate places along the trail as we needed them. Ready to return on a cooler day and do the whole trail in one day - but shuttle service is needed! Captivating route and friendly faces the whole time. Best time to take this route is morning and evening. The afternoon when the sun is at its fullest it gets a extra hot from the black asphalt increasing the actual temperature. There are two kinds of users on this trail: spandex Cat 6 racers and clueless newbies. The Capital Trail is nice smooth rolling asphalt, which means it is plagued by hundreds of Strava time trialists going too fast for conditions. And there are hundreds more rank amateurs who have never used a multi-use path before. Riding on the left, riding 2 and 3 abreast, zig zagging, stopping on the trail, you'll see it all. I've even rung my bell and called out to pass only to have the newbie become infuriated as if I had insulted them. But more commonly you will be approaching a congested area like the Four Mile Creek parking lot when a time trialist silently snakes you at 25mph with no warning. There is just a total disregard for etiquette here. So the best time to use the trail is weekdays or not so nice weather. Seriously, the people on this trail are clueless. 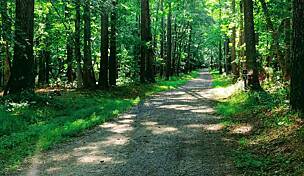 The trail itself is very nice asphalt with gently rolling terrain through a mix of woods and fields. 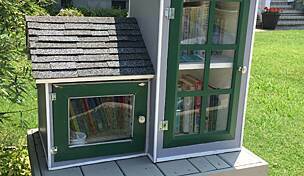 There are few amenities. The only bathrooms are a port a john at Four Mile Creek, bathrooms at Chickahominy Riverfront Park, and at Lewis Park in Charles City, about a mile off the trail. There is one restaurant in Charles City, a BBQ spot in Varina, and a few country gas stations along Route 5. If you want to go to Williamsburg you continue on the Colonial Parkway from the Jamestown parking lot for about 7-8 miles. One of our sons and his family live in RVA directly above Great Shiplock Park, MM 53. 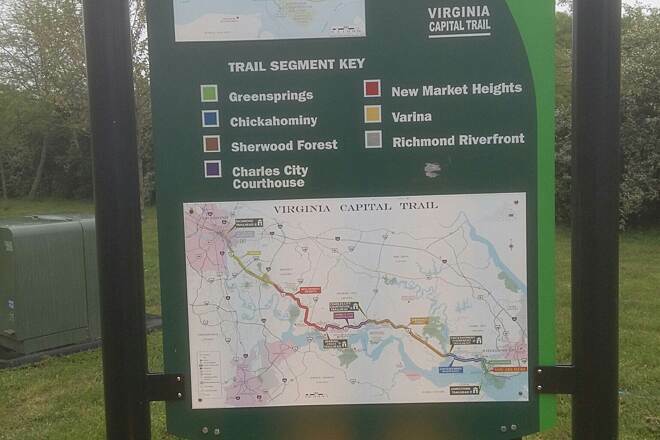 We (my wife/stoker and I) were excited when we read of the VA Capital Trail and were excited to have it open late last summer; we started making plans to have a go. Our plan was to spend a day peddling down to the Jamestown/Colonial Williamsburg area, and then spend the following day exploring Colonial Williamsburg and peddle back to RVA the 3rd day. We are happy to report that our plan worked to near perfection. We rolled down Church Hill the morning of Tuesday, 31 May 2016, took the obligatory selfie at the MM and headed off toward Jamestown. Living in Indiana, we know flat when we see it but we were pleasantly surprised at the rolling nature of some of the trail sections. The trail was smooth, well maintained, and exceedingly pleasant. The only reason we gave it 4 stars and not 5 was due to the fact that the trail spends a good bit of its length in close proximity to the road. However, it did move away from the road more than we expected having read prior reviews. We took our time (averaging just over 13 mph down and back), and enjoyed the journey. we stopped for a nice lunch at Cul's Courthouse Grille (nearly full of bicyclists when we arrived : ) and were buying our tickets to checkout Jamestown about 2:30. We were a bit rushed in Jamestown (closing at 5:00 but we felt like we learned a lot). We then followed the Colonial Parkway to Williamsburg (we found the composite surface was not too rough with the 32s on our tandem). The good people at the Williamsburg Comfort Inn Gateway kindly welcomed us and encouraged us to store our bike in our room. We took the day off the bike on Wednesday and walked through Colonial Williamsburg. Time well spent! On Thursday, 02 June 2016 we started our trip back to RVA in a bit of a mist that persisted until we arrived at Jamestown Island (again, using the Colonial Parkway). we were never really sure if it was rain or just a heavy fog but it did not keep us from enjoying the route. We decided to do the extended loop around Jamestown Island and we were glad we did - a very enjoyable trail. Once we completed the loop, we peddled back to the Capital Trail MM 0 and headed back. We did not stop for a meal on the way back to RVA, just stopping at a gas station along the way for nuts and Gatorade. Unfortunately, the timing for lunch at Ronnie's BBQ did not work out on the way back as we had hoped. We will have to get back there on our next visit. Otherwise, there were sufficient amenities to meet our needs - it seemed there always seemed to be a rest stop available when we needed it. In all, we did 63 miles on the way down and 72 miles on the way back (Jamestown Island loop included) and enjoyed every one; with the possible exception of that last bit! We got to the end of the trail at MM 53 with no problem but we still had to get back to our son's house up on Church Hill. I have to admit we did walk our tandem up a good portion of 'the hill." 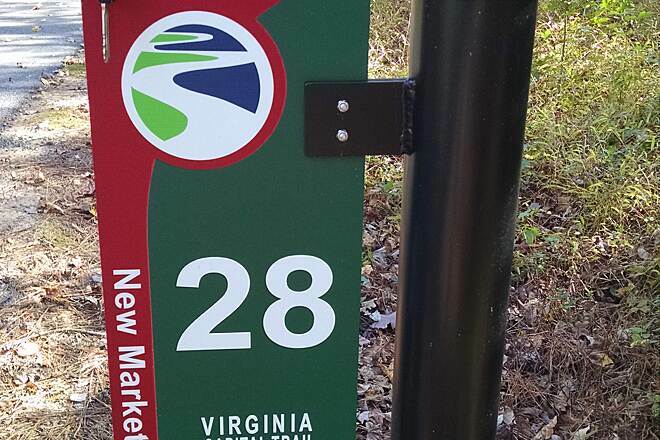 Luckily enough, I live within 10 mins driving distance of the trail, around the 29 mile marker. I've been afford the opportunity to ride the whole trail many times over in segments. The ride from the 29 mile marker to Jamestown has a few hills but for the most part is fairly flat. As for the tree roots...I do agree that this will continue to worsen as time passes. There are 3 convenient stores before you reach the bridge to heaven...what a hill! It does however offer a good view of the river and the occasional watercraft. Always check the weather forecast before riding as I was caught in pretty bad thunderstorm on my return trip...it's always fun dodging lighting bolts. There is a very nice parking area located at the I295 and Rt.5 exit directly across from the Exxon and food stop. This section towards Richmond is probably the nicest as it winds back through the a heavily wooded area back under I295. Plenty of wooden bridges to admirer...I give this 2 thumbs up. There are plenty of stops along the way to grab a bite to eat. Upon approaching Richmond as you round the curve the skyline opens up...just breath taking. Don't look to long and hang on there's massive hill not to far...quite fun on a fixed gear with no freewheel. The whole trail is quite enjoyable and will be used frequently by my two wheel friend...so stop reading this post and go ride it! Richmond to Jamestown and back....well not quite! Parked down at Ship Lock Park at 6:30 am and pedaled to the Canal Walk first and then back-tracked to marker 53. If you can pedal up and over the long hill coming out of Richmond, you'll be fine for the next 8-10 miles, then it's a series of up and downs along Route 5. Make sure you have plenty of water if you plan on doing the whole length. There's a few places to stop at for drinks along the way but they're few and far between. I made it to Jamestown by 12:40 and turned around the started back. Within the first 5 miles I could tell I wasn't going to make the whole trip back to Richmond so I called my wife to meet me at Charles City to have dinner at Cul's Courthouse Grille and load up my bike for the ride home. The condition of the trail was a 8.5 out of 10. The older section towards Jamestown has some tree root issues, which are causing the blacktop to buckle up and make for a bumpy ride in some areas. 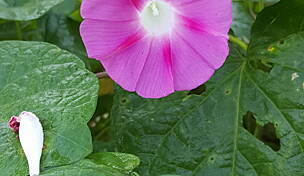 Also be careful for the Sweet Gum seed pods during the winter and early spring months. I noticed quite a few of them on the trail and they could cause tire issues. Overall it's a great trail and I give it a 4 star...it would have gotten a 5 if it was built away from a high traveled road like Rt. 5. I ended up pedaling 75 miles that day....but I'll be back to do the complete round-trip of the trail. We rented bikes from the James County Marina on Jamestown Rd. Google maps could not find this place but if you turn on Colonial Parkway to go to the Jamestown Settlement it is located just pass the Jamestown Settlement on your left. This is the only place you can rent bikes from the Jamestown end of the trail. You can park at the marina for free and bike rentals cost us $18 for half day. We really enjoyed our ride. The trail was beautiful, wide, mostly tree-lined, clearly marked, well-maintained and away from the main roads. There were a few places you had to cross the main road but it wasn't too bad because there was not too many cars that traveled those roads. You should bring water and pack a lunch. There is no businesses until a service station pass the 12 mile marker. There you can pick up sandwiches and drinks. We heard there is a restaurant you can go to at the 20 mile marker but we had to turn back before then since we had to return our bikes before the marina closed. I am a 57 year old woman and have enjoyed distance walking for much of my life. In the past two years I started running and enjoyed meeting some new challenges in that regard, but decided to give it up for the sake of my knees. Wanting a new goal to shoot for I had recently started thinking how fun it would be to walk from Richmond to Williamsburg or Charlottesville- but did not think there was a safe way to meet that goal. 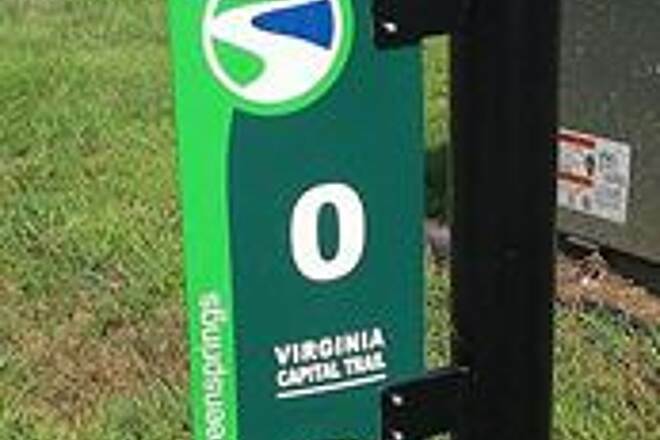 Then I read an article on the completion of the Virginia Capital Trail! I walked the first leg from The trail head in Richmond to Cul's Courthouse Grille in Charles City on December 4. Thinking that the trail ran along route 5, I expected it to be around 28 miles, but because of the part of the trail that allows safe passage around Interstate 295, it turned out to be 32.7 miles. The day was beautiful and cool, there were convenience stores and bathrooms to be found on the first half of the day, but I was glad that I had packed enough snacks and extra water for the 2nd half. 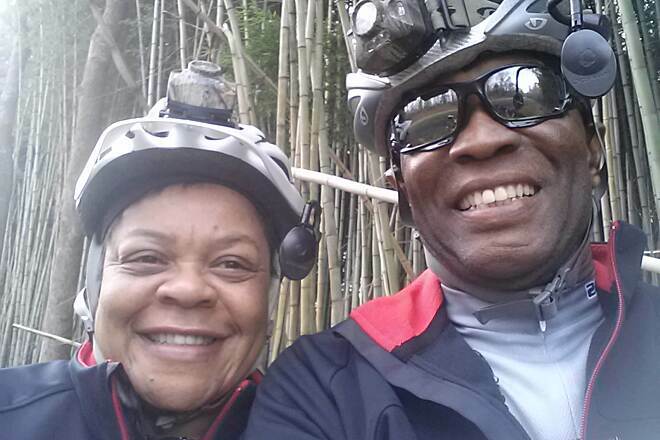 Thanks to my husband, I had a ride back to Richmond after completing the first 1/2 of the trail. 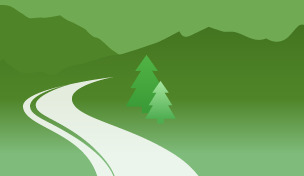 I walked the 2nd 1/2 of the trail on December 18. I parked my car at the Charles City courthouse and headed out... The walk to the Jamestown Settlement was 20.3 miles and my family met me there and gave me a ride back to my car in Charles City! I thoroughly enjoyed both days of walking though found the terrain to be more varied on the leg from Richmond to Charles City. The trail is beautifully maintained and landscaped and felt very safe. The trail markers every mile keep you feeling very connected to where you are on your journey...I encountered both casual and distance bikers and a few walkers. The only amenities I found lacking were benches or places to take a break that didn't involve sitting on the ground. I thoroughly enjoyed my experience - Thank you! September 2015 This is the best trail we have ever been on. 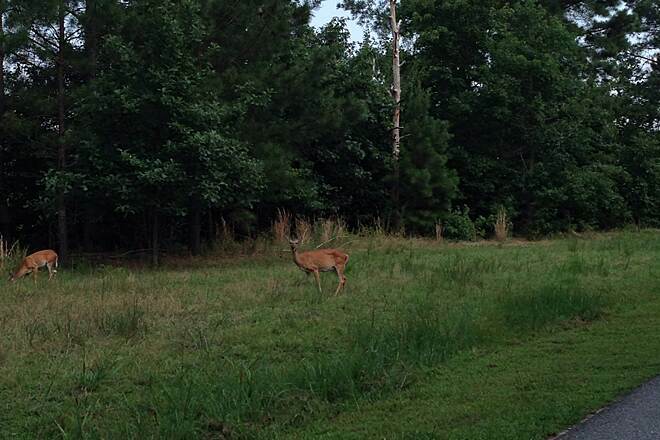 For the past few years we have been staying at the Chickahominy Riverfront State Park Campground. Going south into Jamestown is busier with more street crossing that you have to slow down or stop at. Going North is fantastic with only a couple of traffic areas in Charles City. We did 20 miles up then the 20 back last year. 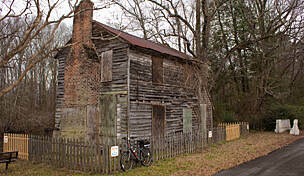 Planning a round trip of 50 next year to the Shirley Plantation. They did a real nice job of not making it just straight along route 5, it is gently winding. 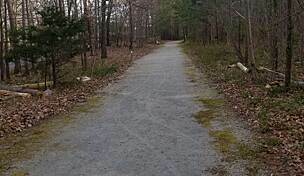 It is so nice staying at the campground and heading out with the trail right in front of you. 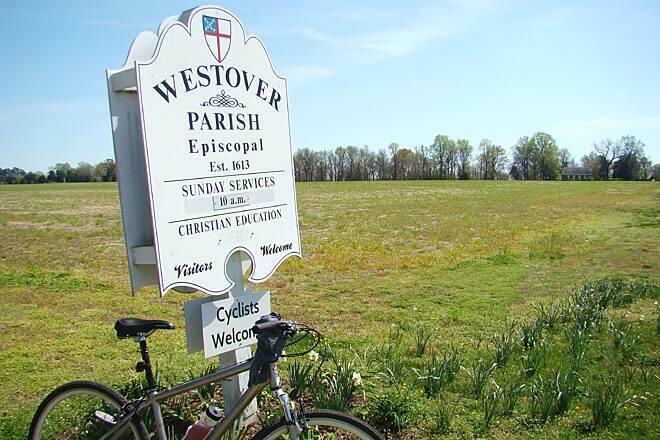 Rode from Richmond to Jamestown on October 24, 2015. 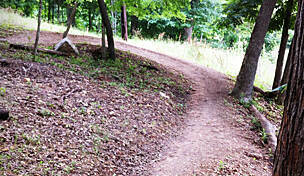 The trail is about eight feet wide for most of its length and has gentle rolling hills throughout its length. Views are primarily restricted to the adjacent woods or roadway, but is separated from the road by a wide grassy area abundantly populated by trees. 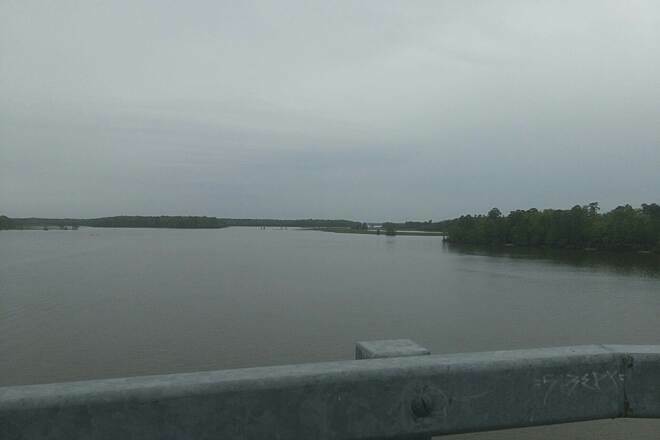 There's an elevated view of the river when on the top of the bridge near the Chickahominy campground on Rt 5. It's a great trail for a long ride, but not a lot of places to refill water bottles, go to the bathroom, or buy food. I began in downtown Richmond, easy free parking by the river and a wonderful pizza lunch at Bottoms Up restaurant right along the trail. Biked about 7 miles east on a perfect fall day and got off the trail to explore Battlefield Parkway, which was fantastic: five earthen fortifications and Civil War battle trenches all along the parkway, with great photographs from 1865 on display at the Union and Confederate forts. The battles were well described at each site. This side trip was a surprise bonus to riding on a brand new, asphalt trail. 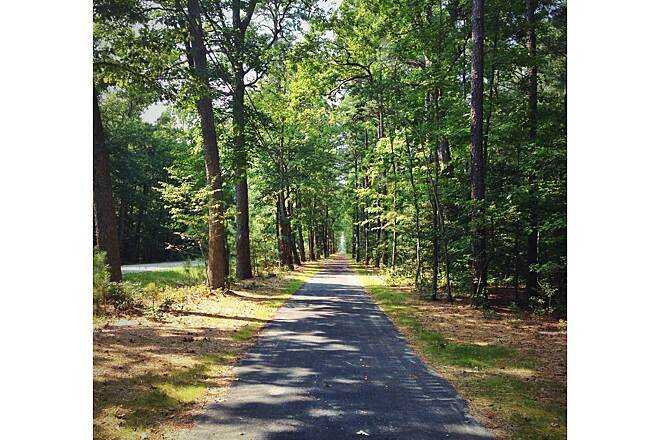 Beautiful mansions, farm fields, and the James River are all very pleasant accompaniments to this trail. Can't wait to go back and explore plantations along this trail to Williamsburg and some of the other 17 Civil War sites in the Richmond area. 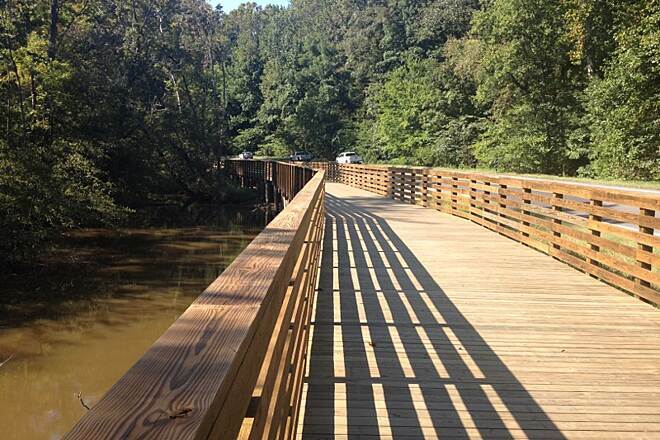 Virginia has THE best bike trails: New River, Virginia Creeper, and Capital-Capital!! We just rode this trail and did 60 miles on it and it is just a great trail! It is paved and plenty wide enough, and also virtually flat. Except the bridge which puts a little challenge into the ride! The only thing that could make this trail better would be some guard rails on the road which is right next to the trail. 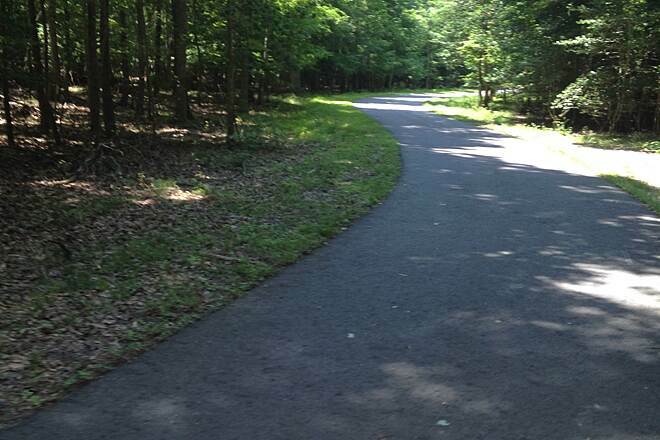 We rode it from Jamestown to the outskirts of Charles County Courthouse and loved every minute on this trail! Great trail, but some hills are challenging with a trailer. My wife and I rode the tail from Richmond to Williamsburg (the last few miles were off the trail) this past Saturday on our Origami Crane 8 folding bikes. The trail is wonderful, but there are a few hills that make pulling a 60-pound trailer a bit of a challenge. There are not many services available once you get past Varina, but there is a wonderful little restaurant right on the trail, about 30 miles east of Richmond, that offers great food and a charming atmosphere. The restaurant is in an old (maybe early 1800's) building. 53 miles from downtown Richmond to Jamestown. Paved with rolling hills and varied landscape. Plenty of trail head parking at various spots along the trail for shorter rides. A very well done developed trail. 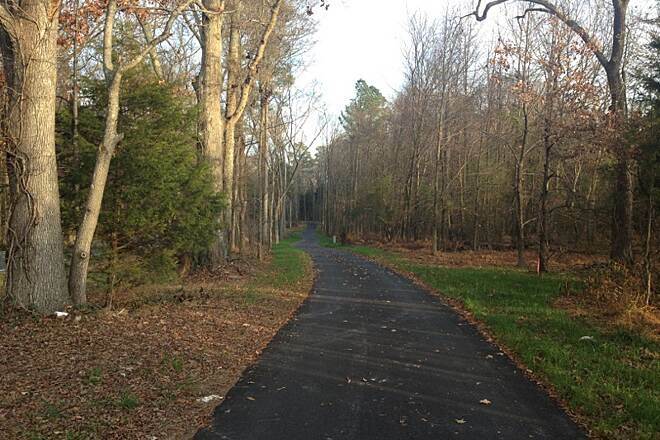 When this trail fully opens in October 2015 - there will be lots of happy riders in Eastern Virginia. I rode it end to end on 8/15/15 from Jamestown to the current terminus near Herring Creek in Charles City County (about 29 miles one-way). The route is very well marked with signs and mile markers. Smooth, wide pavement and excellent condition of bridges throughout. Two scenic highlights and resting points are the Chickahominy Riverfront Park (beautiful views from the wide bridge), and the Charles City County Visitor Center (America's 3rd oldest court house building). Public restrooms are available at both locations. I rode early - leaving Jamestown at 7AM. By the time I was heading back east, I was in need of more "fuel" - and thankfully there was a gas station / small country store just east of the Charles City County visitor's center - drinks and various granola bars available. 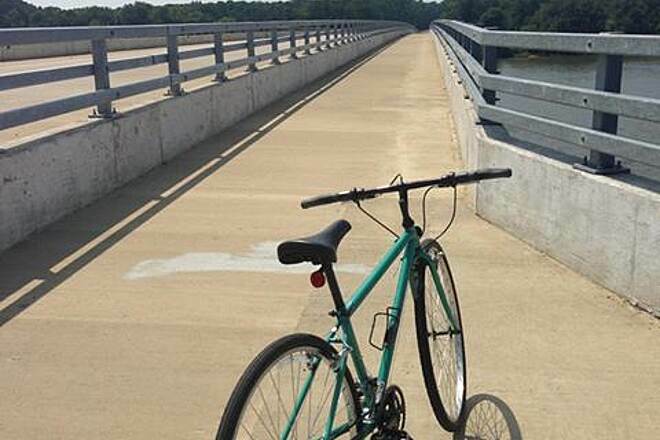 The route has varying scenery and landscape - from riverfront views, corn and soybean fields - to wooded sections. Despite the route's proximity to Route 5 - it still is a place to escape modern life (although I predict the trail will become crowded with day-trippers like me when it connects to downtown Richmond). Another trail highlight is the history. There are lots of markers along the route - detailing everything from the various plantation homes to the native tribes that pre-dated Jamestown settlement. I look forward to the trail connecting Richmond to Jamestown - and predict it will quickly provide a major tourism boost to the area. I parked near the Welcome Center and rode out 15 miles towards Richmond and turned around shortly after to equal 30 miles total. The trails are wide enough for 3 rider's to be on at the same time. Not a lot of hills and the scenary is beautiful. Great for a new rider or an experienced one without worrying about the traffic. :). Great for as a family ride or a "solo" ride. A must do and must see trail! I parked at the visitors center near the library, no issues and the bathrooms were nice and clean. Great bike ride. I wish there was a few more places to park pending the direction you are coming from. 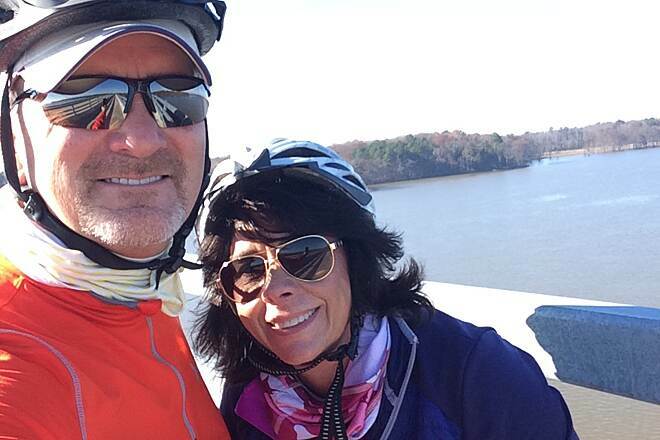 This spring my wife and I took the Virginia Capital Trail out and back from Charles City to Jamestown Settlement. We started out at Charles City, parking in the courthouse parking lot. There is plenty of room for free parking and there are clean bathrooms available. Just down the hill is the trail, which is paved all the way to Jamestown Settlement. The trail is mostly flat and you can go a bit faster because it is paved. It was a rainy day so we did not stop much along the trip, but there isn’t a lot to stop for except for a break or a photograph. I had wished we had been on the trail a couple of weeks earlier because there are daffodils planted all along the trail, but the flowers had since died. At about 10 miles in we crossed the James River. The weather was not very good so it was not as an impressive view as it could have been. We arrived in Jamestown Settlement, stopped for some coffee at the welcome center, and headed back out on the trail. Overall this is a nice trail and great for people that want to stay on asphalt, but there is not much to see. There were actually quite a few other people and families out on bikes that day, even with the bad weather. I think next time I would like to continue all the way to Williamsburg connecting at the Colonial National Historic Highway. Started at the Jamestown visitors parking lot and rode out 6 miles before turning around and returning. The first 3 miles are thru beautiful country side , but the trail then joins rte 5 and although fairly flat and well paved the scenery is route 5 and lacks any appeal perhaps it picks up the closer u get to the river. Called a rail trail but it is a paved greenway and not a rail trail. Over all a very nice trail and if I am ever back in the area I would ride it again! We rode the Virginia Capital Trail for the 2nd time today. We were able to get in 18 miles by going around a couple of "road closed" signs. It is a great trail, lots of shade, fairly flat, beautiful countryside. I highly recommend. My wife, daughter, son-in-law and myself rode the trail on a Saturday morning. We parked at the Charles City County parking lot which had plenty of parking. There are bathrooms in the complex which was convenient after driving 40 minutes. We rode West for about 7.75 miles until the trail ended which was a pretty easy ride and returned to the lot. There are some rolling hills but nothing really challenging so the average rider will have no problem at all. 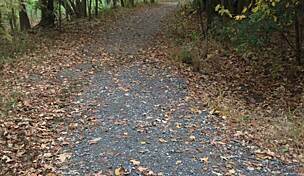 The trail is asphalt so it is a very smooth ride. I am from Pa. and am very jealous as we have nothing like this in my area. After we wee done we walked across the street to the Courthouse Grill for lunch. They were extremely busy as there was a group of 30 bike riders there before us. Took awhile to get our food but was to be expected with such a large group. No complaints about the service or quality of food. When we left we traveled towards Jamestown and noticed the trail is almost finished with the exception of a few miles here and there. 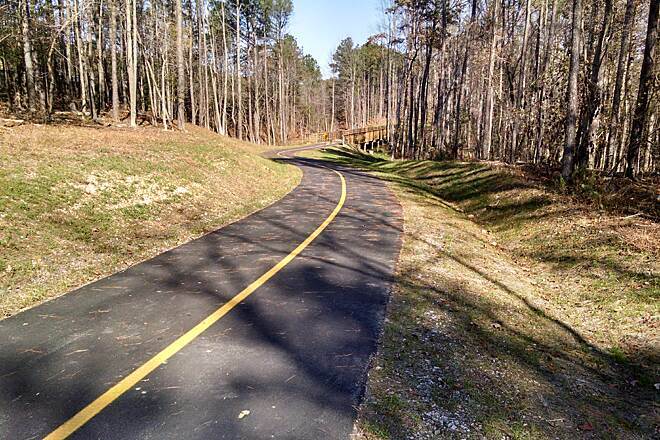 Can't wait to come back and experience this trail when it is completed to Richmond. 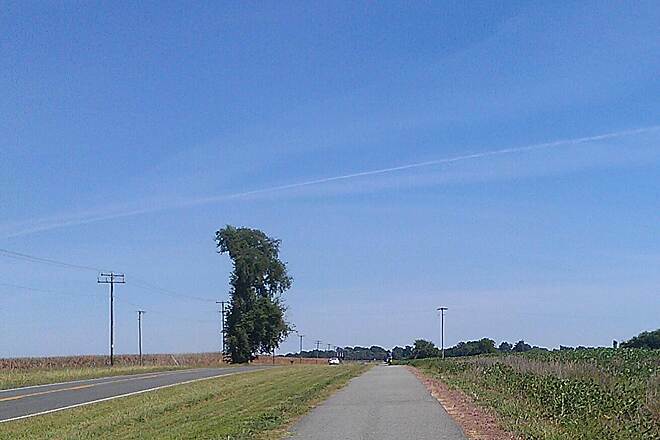 We rode the eastern end of the Virginia Capital Trail on Sunday 9/1/2013. This was our first time on this part of the trail. We have previously ridden the Charles City portion several times. We parked at the Jamestown parking lot. The trail was mostly flat with a couple of road crossings that were easy to manage. We were surprised at the amount of shade throughout the entire early afternoon ride. We encountered a few walkers (near Greensprings – as to be expected) and several other bikers, but had the trail to ourselves. We could ride side-by-side at a great pace for a much of the trail. There are some benches in the Greensprings portion in case you need a break. We also rode on the Dresser bridge. the views were great and I felt very safe on the bridge. 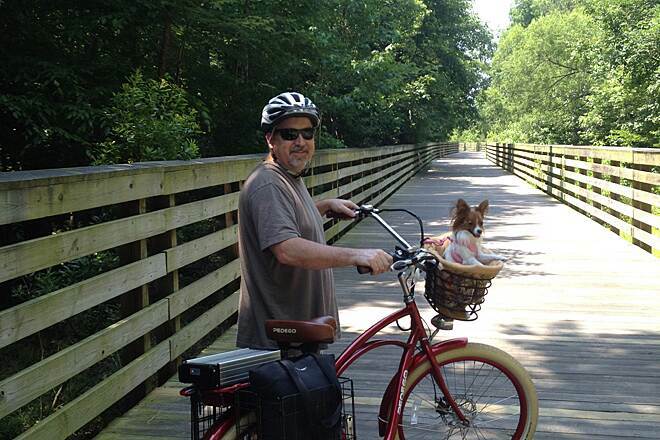 To add to our ride, we rode the Powhatan Creek Trail. 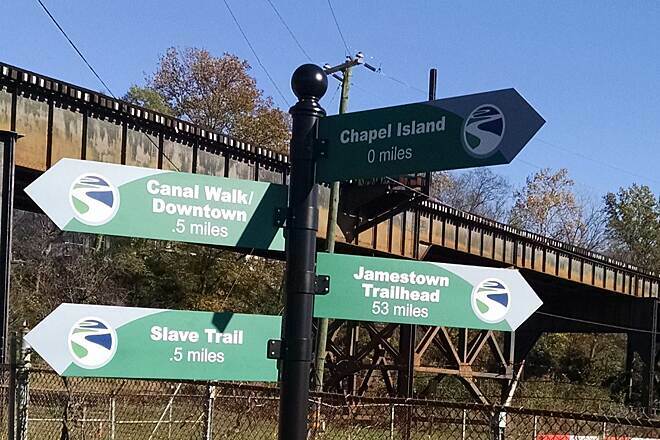 You can find info on the trail on the James City County website. The trail connects directly to the VCT and begins in a field. Then you wind around the back of a neighborhood. Finally, you get to Powhatan Creek and the riding terrain is more diverse, shaded, and beautiful. There are a couple of bridges and some hills, but it is well worth it. The trail ends at an elementary school. We also took the advice of some locals and rode on Jamestown Island. This is adjacent to Jamestown. Some sources say you have to pay ($14 pp) but the information center on the island did not charge us since we were only going to ride (and not see the island attraction). 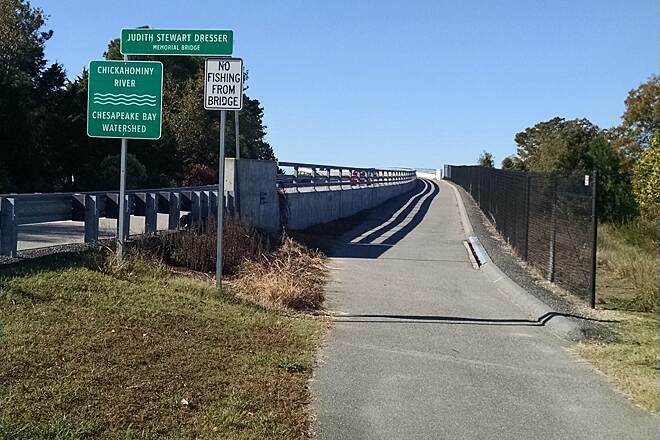 A brochure on Williamsburg bike trails states that this is the safest for beginners and/or families, however, it does share the road with cars driving in to read the interpretive signs. The advantage is the speed limit is 15 mph. I found the vehicles to be very accommodating to us, but the road is narrow, and sometimes the cars had difficulty passing us. Eco Discovery Park is located across from Jamestown. They have bike rentals available (comfort bikes and mountain bikes). They were also generous enough to lend us helmets for the day at no charge. Overall, we were very pleased with our trip and were able to ride nearly 25 miles only unloading the bikes once! My husband and I set out to bike the Chicahominy River Section of the trail but after a mile or two decide that this was not for us. This trail was along side a very busy section of RT. 5. With that said the trail is paved and smooth and plenty of bikers enjoying the trail. We decided to try the Charles City Courthouse trail. Although it also runs along side of RT. 5 it is not as busy and the scenery is completely different. There are corn fields and wheat fields, plantations along the way and not as flat. However the trail head is difficult to find. Park at the back of the court house cut through to the front of the court building go through the grass on to the road that has the brick city buildings go past the post office and right past the Methodist church you will see the beginning of the trail. There was a lovely restaurant called Charles City Tavern that we stopped at on the way back. Great service and the food was wonderful. My friend and I have ridden this trail several times. The surface is asphalt and is great. Nothing too steep, either. It is a nice local ride for us. We have ridden the Greensprings and Charles City Courthouse sections and walked the Richmond Riverfront section. I'd have to say the best part is the Charles City Courthouse section because when you are done, there's the Courthouse Grill right across the street from the visitor/parking area--delicious food! 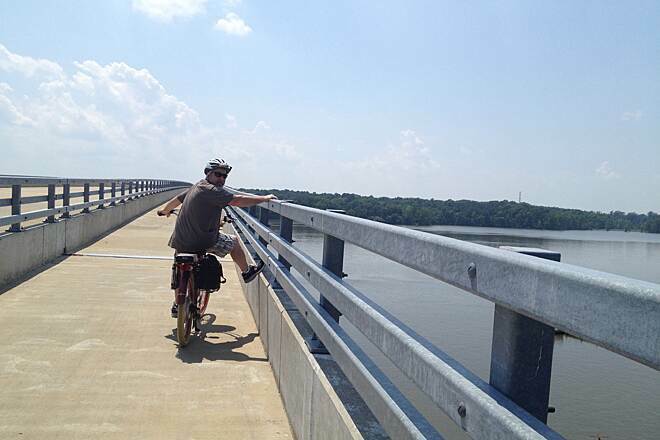 It will be nice when the entire route is complete and one can ride from Jamestown to Richmond. Had to knock off one star because the scenery is just OK.
We are from NC and visit family often in Williamsburg. We always bring our bikes and enjoy riding this trail. It is wonderful. Would like to see the Chicahominy River Section and Charles City Courthouse Section connected. Hope it happens soon. This is a really nice ~6 mile section of smooth pavement for inline skating. Motor vehicle traffic is prohibited, and they seem to do a pretty nice job of keeping the debris clear. The trail parallels Rt. 5 (I think it used to be Rt. 5), is generally flat, with just a couple turns and small hills. I was there a couple Saturdays ago (Oct. 2011) and I met only two bikers during the entire 12 mile round trip. Park at the courthouse and skate-up there, then it's just a block or so to the trail head. Just a couple intersections to worry about. Nice.